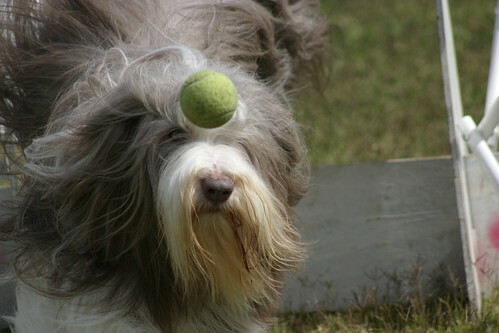 It was a cool windy October 4th day for our second annual Bearded Collie Demo. It took place at the Antique Gas and Steam Museum in Vista, Ca. which offers plenty of room. Most of the Ballistic Racers Flyball Team attended the event which was fun for everyone, especially the dogs. As soon as the Ballistic Racers did the demo, it was time for the Beardies. The Bearded Collie Bunch really got into the action as they tried running their dogs on the Flyball course. Some Beardies did well, while others found the course quite a challenge. Thanks to the Beardie Bunch for providing such a delicious lunch. There were so many types of food to choose from that we had to try them all. It was another one of our “Great Fun Flyball Days” with the Ballistic Racers Flyball Team. Many thanks to our late flyball team member, Lori Fournier, who made this all possible. Lori and her dog Harlow loved flyball and wanted to share it with all the Beardie Bunch. Thanks to Lori, the fun lives on! Click here to see the slideshow! !